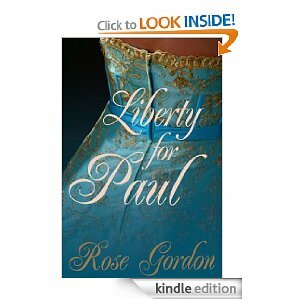 Today we have interviewed a writer named Rose Gordon who has been testing out the delights of the self-publishing world with her historical romances. Because I’m lazy. I figured there were not nearly as many pressing responsibilities involved with writing books then taking care of cats. The answer to this won’t be very eloquent, I’m afraid, but it will be frank. Cats use a litterbox, Sugar Gliders do not! Yuck! 3) Why is your household currently deprived of a cat, and how much would a cat love to “watch” your tank of fancy fish? My household is deprived of a cat because my little boys–ages four and five–would torture any poor kitty that so much as put a paw in the front door! However, if a cat could survive stepping over legos, dodging projectiles in the form of GI Joes with a makeshift parachute (AKA my fancy cloth napkins), heavy petting (get your mind out of the litterbox), and having an occasional “juice bath”, then I’d imagine that kitty would love to look at my 55 gallon fish tank stocked with tetras, sharks and even an CATfish. 4) Tell me about the felines in your fiction. How often do they appear and how big a part do they play in your narratives? Well, this is a tricky question, I’m afraid. I have only one cat-like creature in my books. Her name is Lady Olivia. She’s a rather nasty character who likes to sharpen her claws from time to time in my prose. 5) On the off-chance you have yet to incorporate cats into your fiction, when or how do you plan to rectify this egregious error and demonstration of poor writing skills? 6) If you were going to edit one of your books to include a cat as a main character or important secondary character, which book would it be and how would you enact this awesome revision? I wouldn’t. To be honest, I have such love and respect for the felines of this world I couldn’t possibly put them through the havoc I bring about to my main characters. 7) Have you incorporated any tarantulas into your fiction or possibly nonfiction blog posts or artistic renderings? Wow, thanks for the great idea… I think I’ll have Harry make an appearance in one of my novels. 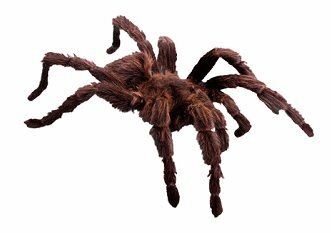 I don’t typically write books or blog posts about tarantulas. However, I have owned and buried (complete with a thirty minute funeral) three tarantulas. Cuddly little creatures, to be sure. 8) What are your favorite works of fiction or cinema involving cats or favorite fictional cats? 9) Do you have any amazing, or at least humorous, cat stories you’d like to share? Barring cat stories, you may share stories about dogs embarrassing themselves if you like. Well, this isn’t necessarily about a dog embarrassing himself, but me. When I was 18 I was a poor college student doing odd jobs for money. One day the pastor from my church asked me to come over and rake his leaves. I did then he gave me his pool skimmer and asked me to get the leaves out of the pool. I started working and his giant golden retriever came running up behind and started…er…acting out his urges on my my thigh. I tried to step away, and the dog just got more aggressive and the next thing I know, the randy dog and I are in the pool! 10) What’s creepier — tarantulas loose all over your house, a flock of sugar gliders, or weird, stalkery emails from fans? The sugar gliders hands down. Ick. 11) How does your tank of cat snacks, I mean, fish inspire you to be a better writer? My computer is positioned close to my fish tank–well, close enough anyway, as I type I can hear the gurgling which reminds me if I don’t write a good book, those fish will die! I won’t have money for their food, or new filters, or algae treatment, or the heater to keep their water warm…Oh my, the list goes on and on, it breaks my heart just thinking about all the horrible things that might happen to my fish if I don’t write a good story. 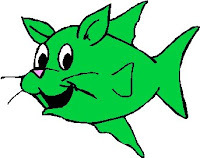 12) Do you think, besides the whiskers, CATfish really deserve to be associated with the superior (aka feline) race? *Ducks head in shame* No. And quite frankly, he was a bad investment. Though it’s fun to say we have a catfish in our tank, he’s very elusive. He (or she?) spends all day, and night, hiding in the decorations. 13) How do you think writers are like cats? Both understand the passive-aggressive personality trait to a T. Writers write characters with it and cats just plain have it! 14) Where can we find out more about you and your books?